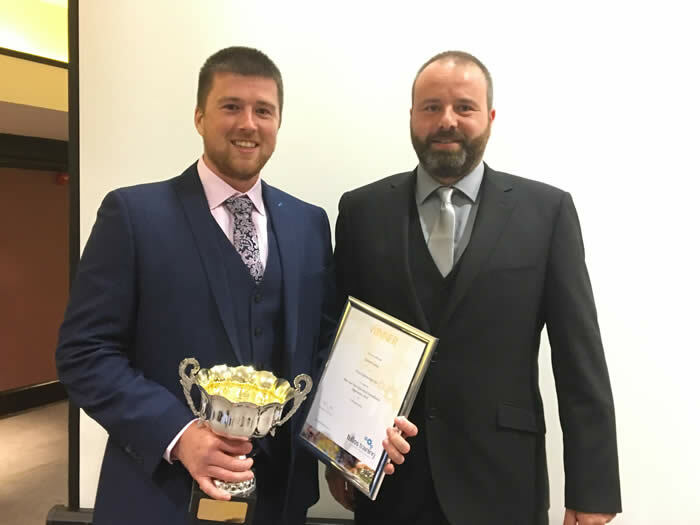 Anne Galbraith, SECTT CEO, was delighted to be at the Tullos Training Awards to see Steven Casey presented with the Tullos Training Apprentice of the Year 2nd Stage winner. SECTT were delighted to be in a position to sponsor both the 1st and 2nd Stage prizes. Steven is a worthy winner and his company, Ness Engineering Ltd, are rightly proud of his achievements. Well done Steven, keep up the good work in Stage 3. 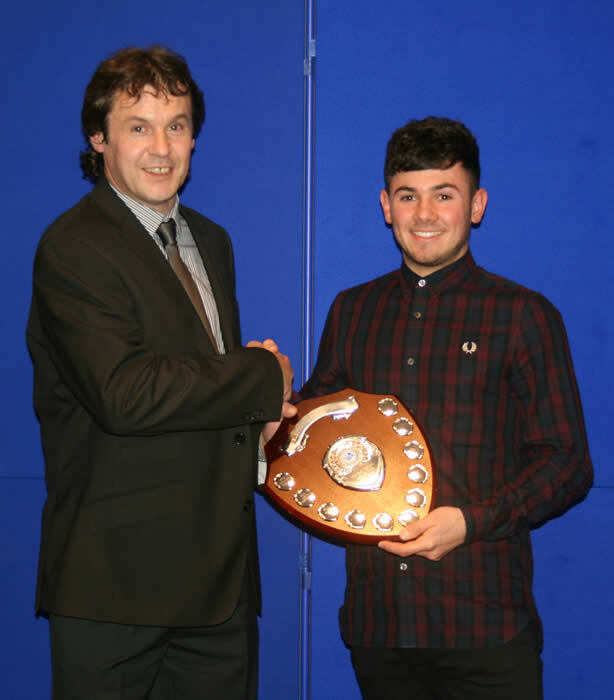 Lewis Sim, Employer McDonald & Munro Ltd, receiving City Electrical Factors Ltd Shield for Top Electrical Apprentice 1st Year from Iain McBean. Daniel Begg, Employer Moray Council DLO, receiving Medlock Electrical Shield for Top Electrical Apprentice 2nd Year from Iain McBean. Jonathan Donaldson, Muirton Control & Automation Ltd, receiving Edmundson Electrical Ltd Shield for Top Electrical Apprentice 3rd Year from Miguel Gomez of McDonald & Munro Ltd.
Jonathan Donaldson receiving the Top Craft Apprentice Award from Raymond More and Andy Jamieson. 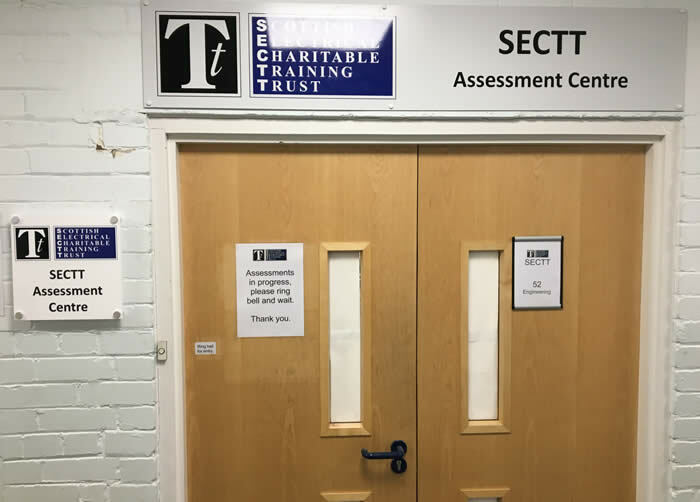 SECTT are pleased to report that they have taken over the management of the Assessment Centre at Edinburgh College, Sighthill Campus. The Assessment Centre opened on Monday 4th September with FICAs already in progress. 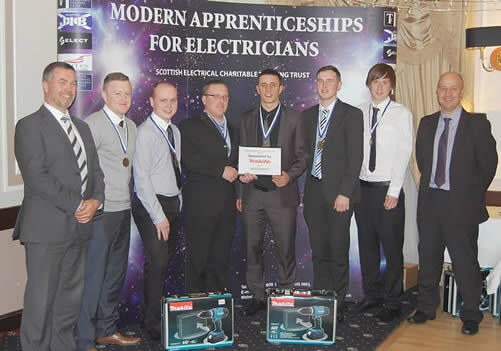 The electrotechnical Modern Apprenticeship competition (eMAc) is organised and run by the Scottish Electrical Charitable Training Trust (SECTT) and aims to recognise the achievements of Scotland’s apprentices as well as demonstrate the level of skill and expertise that will be gained through an apprenticeship. This year’s competition was held on the 23rd August at Moray College. 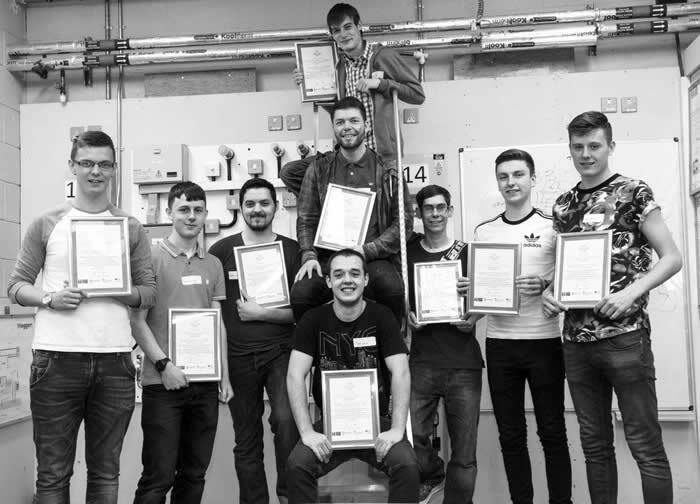 The competitors, 3rd stage 3rd year apprentices from all over Scotland, represented the very best electrical Modern Apprentices in the industry and will, no doubt, become outstanding Electrotechnical operatives. All apprentices and their employers were presented with a framed certificate to recognise their achievement in reaching the final of this Scottish competition. Well done to all those who were selected and competed. 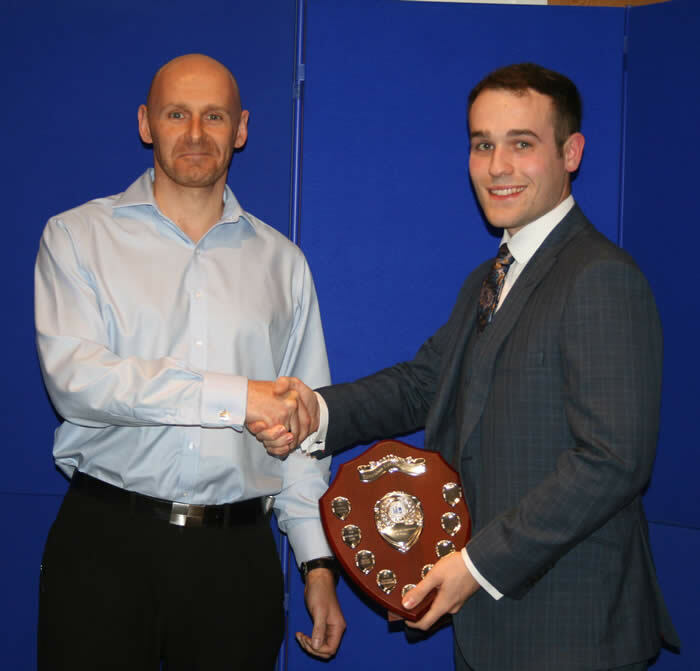 Gold medal winner – Ruaraidh MacCormick of Northern Security Alarms, Inverness, who attended Inverness College UHI. Silver medal winner – Stephen Berry of Electrical Solutions Network Ltd, Ayr, who attended Ayrshire College, Ayr Campus. 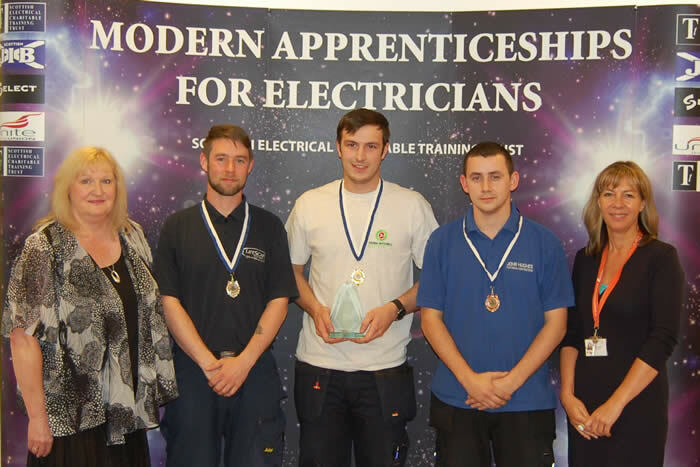 Bronze medal winner – Darren Charles of Smart Electrics Contractors Ltd, Burntisland, who attended Fife College, Stenton Campus. Left to right: Darren Charles, Ruaraidh MacCormick and Stephen Berry. Alan Webster of West Lothian Council, Livingston, who attended Edinburgh College, Sighthill Campus. Liam Kelly of J McKeown, Newton Stewart, who attended Dumfries & Galloway College. Ellis McBride of Shaws Electrical Engineers, Glasgow, who attended West College Scotland, Clydebank Campus. Andrew Henderson of G Henderson Electrical, Forfar, who attended Dundee and Angus College, Kingsway Campus. Sean McCafferty of A M Campbell (UK) Ltd, Peterhead, who attended North East Scotland College, Fraserburgh Campus. Jonathan Donaldson of Muirton Control & Automation Ltd, Keith, who attended Moray College UHI. Dale O'Donnell of Morris & Spottiswood, Glasgow, who attended New College Lanarkshire, Motherwell Campus. The top apprentices from all across the UK will be invited to go forward and compete in the UK skills competition final that is being organised by WorldSkills UK. The event is taking place on 16 – 18 November and is being held at the NEC in Birmingham. The winner of the UK final may also have a chance to join the UK Team at the WorldSkills competition, to compete against other Electrotechnical engineers from all over the world. 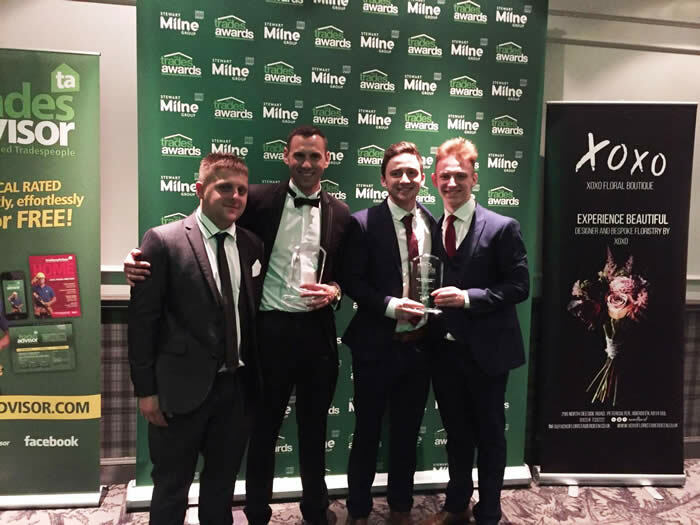 After beating off more than 400 entrants in a national Apprentice of the Year contest to find the UK’s best apprentice electrician, Michael finished runner-up in the competition. Michael received a holiday voucher, engraved glass trophy, an iPad and a kit bag containing a variety of electrical accessories. On qualifying as an electrician in January 2017, Michael received a Level 3 Scottish Vocational Qualification and a Modern Apprenticeship certificate on completion. The Scottish Electrical Charitable Training Trust (SECTT) are delighted to have managed Michael’s training throughout the Modern Apprenticeship, which culminated in Michael qualifying as an electrician in January 2017. Well done and best wishes for the future! Motherwell & Wishaw MSP Clare Adamson this week visited Netherton-based WMQ Building Services Ltd to mark National Apprenticeship Week. The Scottish Government has supported 17,455 Modern Apprenticeships in North Lanarkshire in ten years of Government - with 37,000 young people currently going through an apprenticeship in Scotland. Many areas in Scotland have experienced an increase in Modern Apprenticeships uptake of over 80% in the last 10 years – with 54.9% more MA starts in North Lanarkshire compared to 2007. Bryan Murray from the Scottish Electrical Charitable Training Trust, who supports the apprentices at New College Lanarkshire, was also in attendance alongside John Hollis from Skills Development Scotland. National Apprenticeship Week took place from 6 to 10 March. “I was delighted to meet with WMQ Building Services in my constituency. It’s great to see a local family-run business grow to a level where they are able to take on so many apprentices. It was especially pleasing to meet with the WMQ apprentices Marc, David, Matthew and Darren, all of whom were at different stages in their training. I am delighted that as we celebrate this year’s Scottish Apprenticeship Week, the latest statistics show that the Scottish Government have supported over 200,000 apprentices in 10 years. “In North Lanarkshire, we’ve seen huge growth in the number of apprenticeships since 2007 – increasing from 1,385 in 2007 to 17,455 today. Left to right: Jim Crossar, Operations Director, WMQ; David Lynch, newly qualified electrician; Marc McQuade, 3rd Stage electrical apprentice; Matthew Hillan, 1st Stage electrical apprentice; Clare Adamson MSP; Darren McGuire, 1st Stage mechanical apprentice; John Hollis, SDS; Bryan Murray, Training Officer, SECTT; Gordon McArthur, Managing Director, WMQ. In line with competence based assessment in the Electrical SVQ, SECTT continue to promote training and excellence in the Electrical Contracting industry by organising Apprentice of the Year competitions for both 1st and 2nd Stage apprentices. The finalists had already been through a rigorous assessment of both practical skills and theoretical knowledge in each of their area competitions. The five apprentices who took part in the final on Thursday 6th October 2016 were interviewed by a panel comprising of Fiona Harper (Secretary of the Scottish Joint Industry Board (SJIB), SELECT Head of Employment Affairs and Director of the NET Board), John Noble (Senior Partner John Noble Contractors, SELECT Immediate Past President and SECTT Trustee) and Scott Foley (Regional Officer Unite the Union, Member of the SJIB National Board and SECTT Trustee). The winners received a gold medal, with silver and bronze awarded respectively to the runners up. Sponsorship was received from Makita and White, Milne & Co with drills being generously donated to all the finalists. Bronze – Michael Ferguson – Murray Franklin Electrical Engineers Ltd – Moray College UHI (unfortunately Michael was unable to attend). Left to right: Fiona Harper, Rhys Boni, Lee White, Scott Foley, Mark Savage, Stephen Berry, Sean McCafferty, John Noble. This year’s competition was held over 2 days on 17th and 18th August at West College Scotland, Paisley Campus. 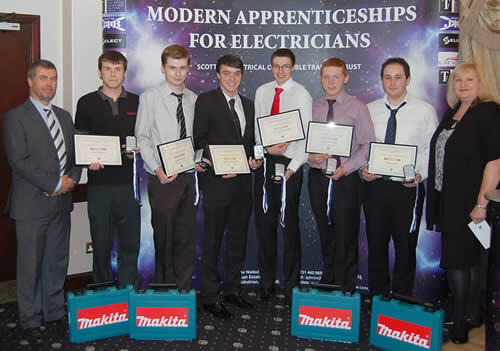 The competitors, 3rd stage 3rd year apprentices from all over Scotland, represented the very best electrical Modern Apprentices in the industry and will, no doubt, become outstanding Electrotechnical operatives. All apprentices and their employers were presented with a framed certificate to recognise their achievement in reaching the final of this Scottish competition. Well done to all those who were selected and competed. 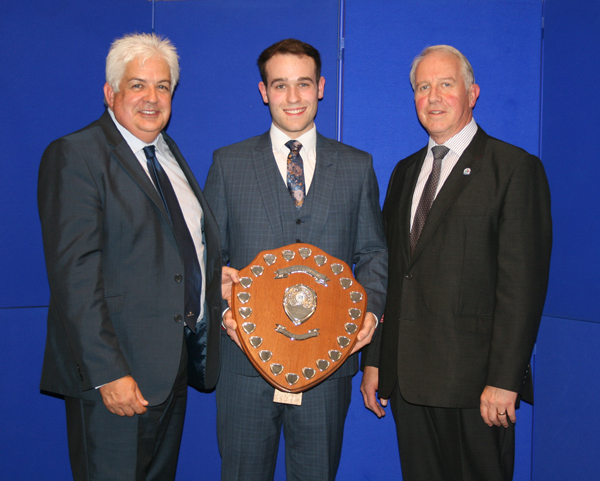 Gold medal winner and recipient of the Quaich – Steven Harper of Derek Mitchell Electrical Ltd, Castle Douglas, who attended Dumfries & Galloway College. 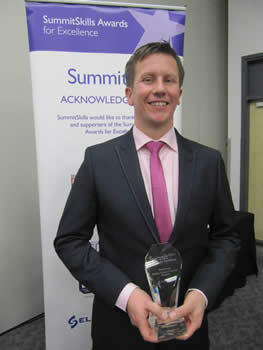 Silver medal winner – Ross Taylor of Lifescan Scotland Ltd, Inverness, who attended Inverness College. 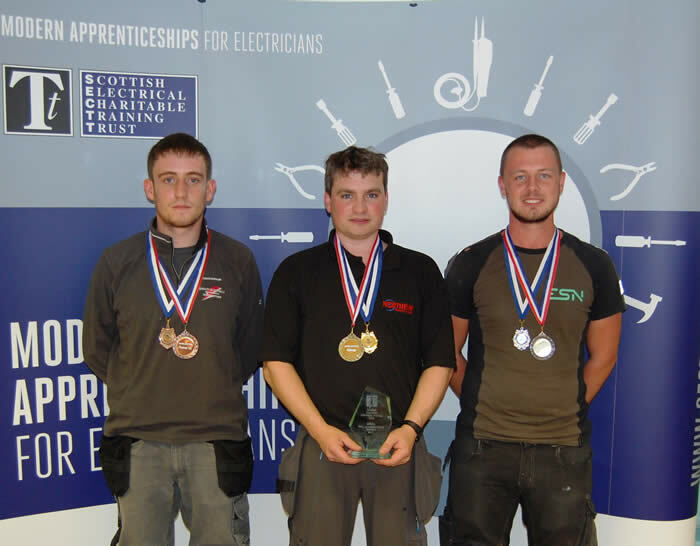 Bronze medal winner – Patrick Carr of John Hughes Electrical Contractor, Carluke, who attended New College Lanarkshire, Motherwell Campus. Left to right: Anne Galbraith (Chief Executive, SECTT), Ross Taylor, Steven Harper, Patrick Carr, Stephanie Graham (Vice Principal Education Leadership, West College Scotland, Paisley Campus). Marc Davidson of FES Ltd, Stirling, who attended West College Scotland, Clydebank Campus. Graham Lorimer of Walkers Shortbread Ltd, Aberlour-on-Spey, who attended Moray College. James McTaggart of Electro Installations (Scotland) Ltd, Maybole, who attended Ayrshire College, Ayr Campus. Lewis Murray of A P E Solutions Ltd, Lochgilphead, who attended West College Scotland, Paisley Campus. Craig Sanderson of McMaster Electrical Services Ltd, Bathgate, who attended Edinburgh College, Sighthill Campus. Harry McRobbie of Douglas McRobbie, Killin, who attended Forth Valley College, Falkirk Campus. Dean Wolecki of Ness Electrical, Forfar, who attended Dundee & Angus College, Kingsway Campus. The top apprentices from all across the UK will be invited to go forward and compete in the UK skills competition final that is being organised by SummitSkills. The event is taking place on 17 – 19 November and is being held at the WorldSkills UK Skills Show at the NEC in Birmingham. The winner of the UK final may also have a chance to join the UK Team at the WorldSkills competition, to compete against other Electrotechnical engineers from all over the world. Trades Awards is an annual event which rewards and recognises tradesmen and trades businesses in North-east Scotland. This year’s Awards Ceremony took place on the 10th June 2016 in Aberdeen. 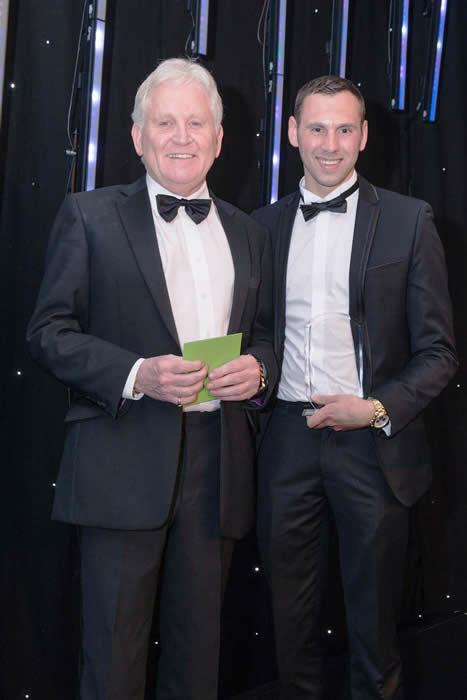 Congratulations to Scott Kelly for winning the award for ‘Tradesman of the Year’ and his company KLY Electrical Ltd for winning ‘Best Trades Business with up to 10 employees’. The company has only been trading for 5 years so this is a fantastic achievement and one to be very proud of. 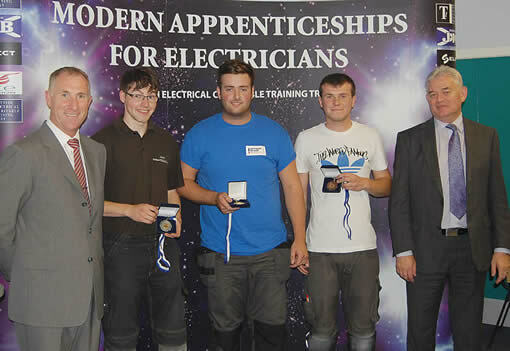 SECTT are delighted to hear of Scott’s awards and hope they continue to train apprentice electricians. Left to right: Greig Slatter (Original 106 FM), Scott Kelly (Director, KLY Electrical Ltd). Left to right: Graham Bradley (Federation of Small Businesses), Scott Kelly (Director, KLY Electrical Ltd). 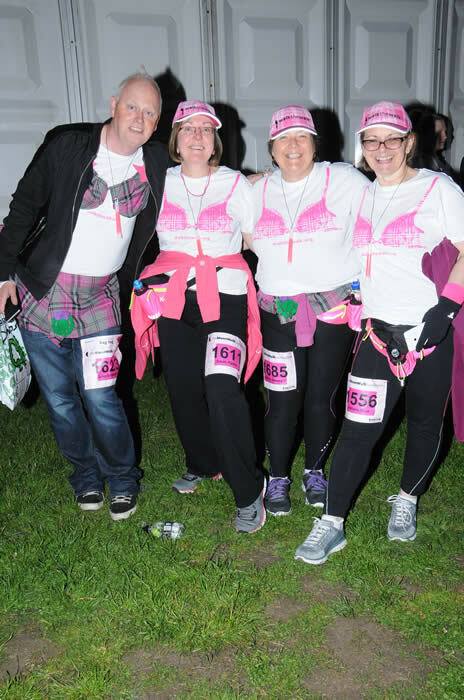 Well done to Sarah, Gillian, John and Adriana who took part in the Edinburgh Walk the Walk half marathon on Saturday 11th June. They completed the walk in an impressive 4 hours and 10 minutes and received a well deserved medal at the finish line. Before the walk (all smiles and not knowing what's ahead)! 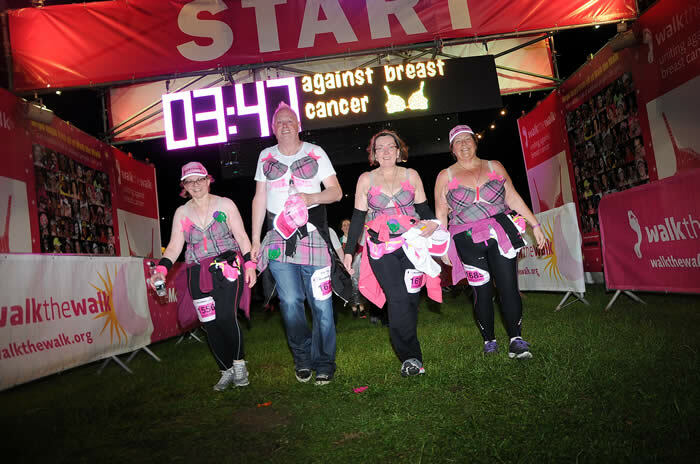 Left to right: John Gillespie, Sarah Parkin, Gillian Harvey and Adriana Main. At the finish line (still smiling)! Left to right: Adriana Main, John Gillespie, Sarah Parkin and Gillian Harvey. Elaine Smith, MSP for Coatbridge and Chryston, visited Mears Group PLC on Friday 4th March to celebrate Scottish Apprenticeship Week. Elaine spoke with various apprentices and was very impressed with the work that the young people do to better help the local communities. Left to right: Gillian Neill (tradesperson), Barry Carr (plumber), Emma Robertson (Administration), Elaine Smith MSP, Leonie Jamieson (plumber), Antony Henry (electrician), James Hamilton (joiner). SECTT were delighted to facilitate a meeting with Richard Kyle MSP to Ingen Technical Services Ltd, Tannochside, Uddingston. Richard met with Iain Colvin the Electrical Operations Manager, Paul Reid a 1st stage electrical apprentice, Ross Menzies a 2nd stage electrical apprentice, Barrie McKay a SECTT Training Officer and Anne Galbraith, SECTT CEO. Richard was very interested in the company and the projects that they had ongoing. Both the apprentices told how much they enjoyed working for the company and being SECTT apprentices. Ross was quick to tell us that he was being given additional training in the office and was thoroughly enjoying this. Iain Colvin explained the projects that the company were working on and how the apprentices enriched them as a company. Iain takes an interest in all aspects of the training both at college and on site and this gives the apprentices encouragement. 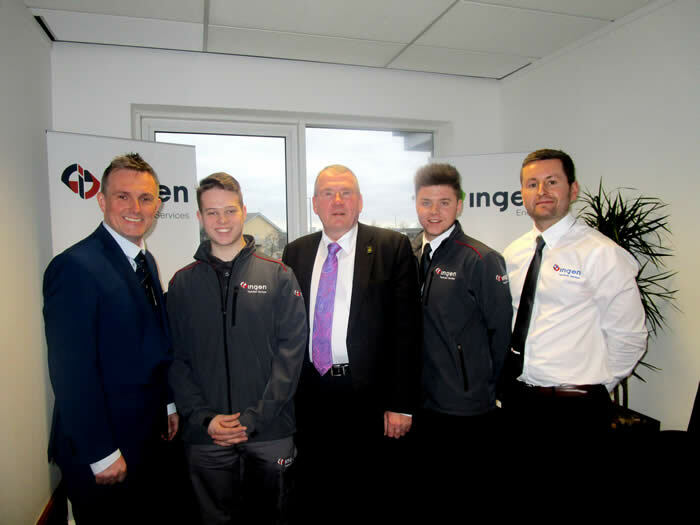 Iain said, “Thanks for selecting Ingen Technical Services for the MSP visit yesterday, we are delighted our commitment to modern apprenticeships is being recognised with such high regard. We are looking forward with promise at employing our next batch of modern apprentices this summer which will further strengthen our site team and ultimately be the future of Ingen. SECTT were delighted to work with Skills Development Scotland to facilitate the filming of Connor Scott for the My World of Work website https://www.myworldofwork.co.uk/electrician-connor. Connor Scott was the winner in the eMAc competition in 2015 and went on to compete at UK Skills at the NEC in Birmingham in November 2015. Each year since 1999, a group made up of local college and university staff and training providers devise and run a series of construction, engineering and building services challenges for teams of S2 pupils (age 13-14). The aim is to highlight the varied and exciting careers in the sector to pupils at this vital stage in their education. All schools in Edinburgh & the Lothians are invited to put forward a team of 10 S2 pupils to compete in the competition. 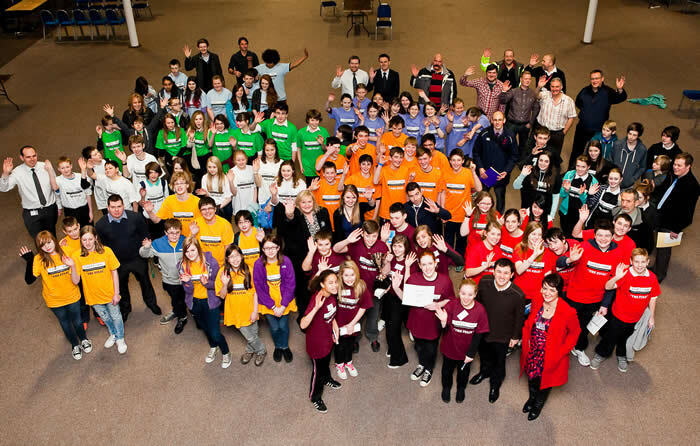 Each of the colleges and universities ran a series of heats for 300 pupils during the year at their own Campus. They provided two activities and a visiting college or university provided the third. Visiting the institutions at their own campus gives pupils the opportunity to explore new learning environments, talk to staff and experts in the field as well as take part in a range of construction, engineering and building services challenges. The heats culminated in the grand final for 100 pupils which took place on the 14th of January 2016 at the Edinburgh Corn Exchange. The Winning team was Firrhill High School who took away the coveted trophy, a cheque for £300 for the CDT department and vouchers for the team. The all-girl team was entered to encourage other girls to think of STEM (science, technology, engineering, maths) subjects that align well with careers in the building services. The runners up were Balerno Community High School and Stewart’s Melville College who both received a cheque for the CDT department and the pupils received vouchers. EETF (SELECT), ESP (Energy Skills Partnership), SummitSkills, CITB (Scotland), SNIPEF, FMB, R A S Crockett and FES. Download the CABEC Final report. The six apprentices who took part in the final on Tuesday 22nd September 2015 were interviewed by a panel comprising of Fiona Harper, Secretary of the Scottish Joint Industry Board (SJIB), Alick Smith, SELECT Past President and Scott Foley,SECTT Trustee, Unite the Union and Member of the SJIB National Board. The winners received a gold medal, with silver and bronze awarded respectively to the runners up. In addition Makita generously donated drills to all the finalists. The next generation of Scottish electricians will have a safe start to their career - thanks to the Scottish Electrical Charitable Training Trust (SECTT) and Electrical Safety First. Almost five hundred apprentices and adult trainees are being supplied with free lockout kits - which could potentially save their lives - by SECTT and Electrical Safety First. Worth £30, the kit will help the electricians ensure that electricity is turned off (and stays off) until electrical work is safely completed. This process, known as safe isolation, is a safety fundamental and essential in helping to avoid a serious or fatal electric shock. SECTT are delighted to have recently worked with the Princes Trust on a “Get into Electrical Installation” programme. In collaboration with Edinburgh College, Princes Trust and the Electrical Education Training Foundation (EETF) we ran a 6 week programme which included one week work experience. 14 candidates were chosen to take part in the programme, and 10 graduated. Anne Galbraith, Chief Executive of SECTT, said "I was most impressed by this group of 10 there is not one that I would not offer employment to. The enthusiasm that was shown by the group was infectious and when visiting them to be asked “can we come in early tomorrow to make sure we get finished?” This is just the attitude that our employers are looking for. A celebration event took place at Edinburgh College and it was a privilege to listen to the group tell us of their experiences. The family and friends in the audience must have been so proud, I know I was!" So far 7 of the group have secured employment as apprentices on the Modern Apprenticeship in Electrical Installation. The others all have interviews and have been offered places on the pre-apprenticeship course with a view to gaining employment in 2016. We are hoping to be able to offer another programme next year. SECTT were delighted to facilitate a meeting with Murdo Fraser MSP and Fife Council during Scottish Apprenticeship Week. The meeting was arranged with Billy Sinclair of Fife Council to highlight apprenticeships, Grace Hardaker 3rd year Electrical Apprentice and Connor Christie 4th year Electrical Apprentice met Murdo Fraser MSP at the Fife Council Training Centre in Kirkcaldy. Murdo spent a considerable amount of time speaking to the apprentices and was most impressed with the training that they had received and Fife Council’s facilities. Roy Dow the SECTT Training and Development Manager, who represented SECTT at the visit, was pleased that Murdo Fraser MSP took considerable time to talk to the apprentices and learn more of the process from recruitment to the Final Integrated Competence Assessment (FICA). It was obvious that Murdo was very interested in the training. SECTT are delighted to be working with the Prince’s Trust supported by the Electrical Education Training Foundation (EETF) to offer 14 young people the opportunity to do a short course at Edinburgh College highlighting Electrical Installation. This will be a four week course from the 6th July until the 1st August. The course will include safe working practices, pvc wiring systems, steel and plastic conduit systems and other related topics. At the end of the 4 weeks we are required to find the candidates a 1 week work placement from Monday 3rd to Friday 7th August. The candidates will all have PPE and a temporary ECS card. Employers in the Edinburgh and Lothians area may wish to consider offering a work placement. If you are in a position to do so please confirm to Adriana Main adriana.main@sectt.org,uk. Jacqueline Wito from the Prince’s Trust will arrange a short visit with employers to complete any paperwork that is required. This venture will be a valuable experience for both employers and candidates and the ultimate aim is for the candidates to be offered a Modern Apprenticeship in Electrical Installation. A celebration event will take place on Wednesday the 12th August at Edinburgh College. Should you require any further information, please do not hesitate to contact Anne Galbraith, CEO, anne.galbraith@sectt.org,uk. Are you aware of our Industry Charity and their Employee and Family Support Programme, which SECTT would like to bring to your attention? The information here describes the free charitable service for companies within our Industry. We want to raise awareness to employees further down the ladder who may not be aware that there is a charity just for them and is here to help them and their families who face everyday life challenges. If you sign up to this they will give a presentation to your employees plus brochures, workplace posters and wallet cards with all relevant information on. Please do get in touch with the Electrical Industries Charity who will come and see you to discuss the benefits to you and your employees. The six apprentices who took part in the final on Wednesday 24th September 2014 were interviewed by a panel comprising of Fiona Harper, Secretary of the Scottish Joint Industry Board (SJIB), Alick Smith, SELECT Past President and Scott Foley,SECTT Trustee, Unite the Union and Member of the SJIB National Board. The AIS Media team filmed a case study of 3 female Apprentice Electricians who all work for RB Grant Electrical Contractors in Fife. Sarah Driscoll (2nd Stage apprentice), Kirsten Campbell (1st Stage apprentice) and Gail Glancy (3rd Stage apprentice) were filmed to promote Electrical Apprenticeships to young people in Scotland. You can hear what they had to say here http://www.youtube.com/watch?v=1fuAroe30sk. 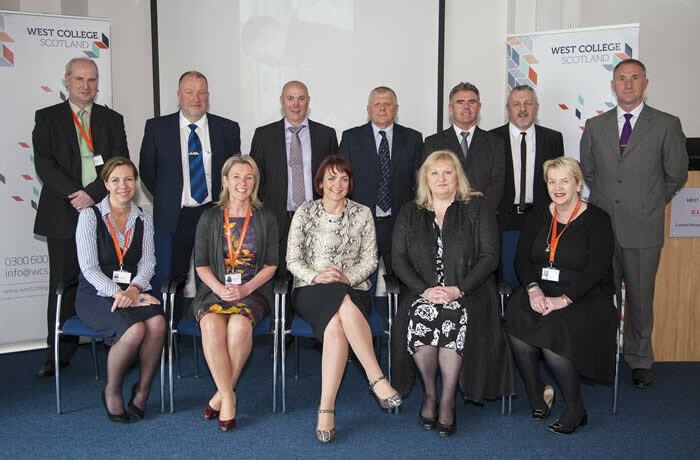 Cabinet Secretary for Training, Youth and Women's Employment, Angela Constance was invited by SECTT to visit West College Scotland’s Clydebank campus on the 23rd of April to meet with College staff, students and employers involved in the Electrical Pre-Apprenticeship Programmes. On Ms Constance’s first engagement as Cabinet Secretary, she listened to an informal presentation about the growth of apprenticeships, which highlighted the positive relationship between SECTT, the College and employers, to help meet the future work force needs and skills. The visit emphasises the pivotal part that we all play Developing Scotland’s Young Workforce, highlighted in the Wood Commission report. “I am both delighted and proud to be able to highlight the Electrical Pre-apprenticeship programme and the positive impact it is having on young people. The results prove that a high number of those on the Electrical Pre-apprenticeship course go on to the Modern Apprenticeship in Electrical Installation, achieving full time sustainable employment and a highly rewarding career. “Colleges have a hugely significant role to play in helping young people towards employment, underlined by the emphasis the Scottish Government has placed on prioritising courses that lead directly to job opportunities. This is precisely the kind of activity our colleges should be taking part in and those that complete the programme will be very well placed to step into employment through a Modern Apprenticeship in Electrical Installation. “This training programme is an excellent example of the benefits that come from West College Scotland’s strong and productive relationships with SECTT and the industry, more widely. The Electrical Pre-Apprenticeship course which the Cabinet Secretary has seen this morning is typical of our approach. It has a great success rate, which means our students are moving into employment and it’s also good news for businesses, which are being provided with well-trained staff. Testament to the success of the Pre-Apprentice programme is Sean Beagan, who is currently an Electrical Apprentice with Glendale Electrical. Sean, aged 18, started his college experience just 3 and half years ago. “School wasn’t for me; I really didn’t enjoy it. So, I asked to come to College and I was placed on the EVIP Engineering, Intermediate 1 in late 2010. At the end of the course there was a choice to apply to either a construction or engineering apprenticeship programme. So, I went on a taster day for the electrical engineering. I liked what it was about, so I applied for the Electrical Pre-Apprenticeship. Anne Galbraith the Chief Executive of SECTT and Andy Taylor the SECTT Assessment Centre Manager, met with Alex Montgomery and Joe McPake of Hager and John Oneil of A & D Cartwright, Specialist & Electrical Distributors, to thank them for their support in supplying distribution boards and breakers main switches for the new FICA booths. Ian Smith Marketing Manager at Hager said “Hager is happy to support SECTT in bringing current and future generations of electrical contractors through apprenticeships and adult training”. 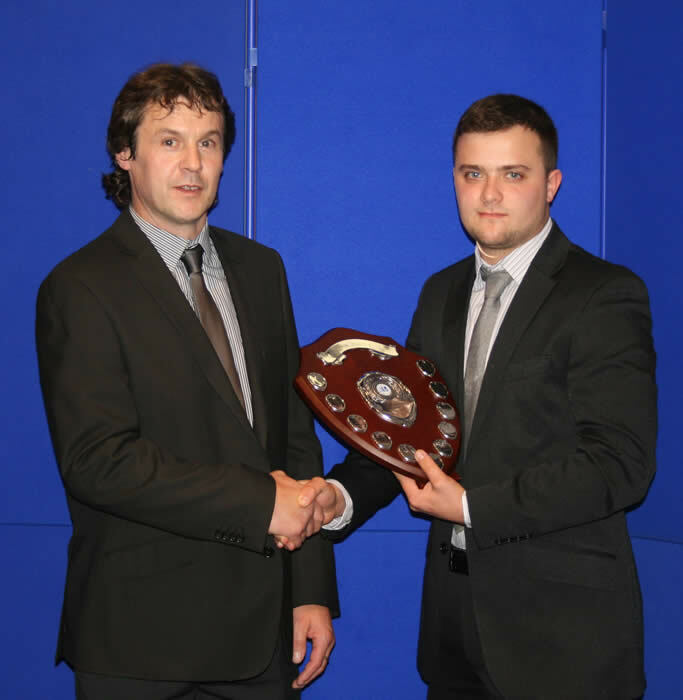 The Experienced Existing Worker of the Year (Electrical) Award was won by Graham Stevenson. Graham is employed by Lightways (Contractors) Ltd. Graham started his working life as a lathe technician however after 6 years in a factory environment he was keen for a change. When a family member offered Graham a job as an HGV driver (if he got his licence, which he did) with Lightways (Contractors) Ltd he jumped at the chance and is still employed with them. Having started off as a driver/labourer 12 years ago then becoming a Ganger. Due to his hard work and commitment he was offered a role as contracts Supervisor for civil works; he then progressed to contracts Manager where he required electrical knowledge. Having shown an aptitude for the electrical aspects he went to the Directors of the Company who explored the SECTT Adult Apprenticeship Course and gave Graham the opportunity to train and become an Electrician. The six apprentices who took part in the final on Wednesday 9th October 2013 were interviewed by a panel comprising of Fiona Harper, Secretary of the Scottish Joint Industry Board (SJIB), Alick Smith, SELECT Past President and Rab Sherry, SECTT Trustee, Unite the Union and Regional Organsier Lead Official for the Union on the SJIB National Board. This year’s competition was held over 2 days on 14th and 15th August at Inverness College UHI. 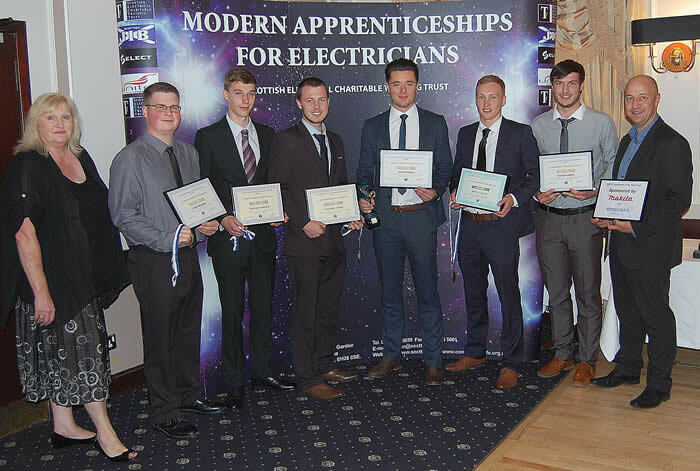 The competitors, 3rd stage 3rd year apprentices from all over Scotland, represented the very best electrical Modern Apprentices in the industry and will, no doubt, become outstanding Electrotechnical operatives. All apprentices and their employers were presented with a framed certificate to recognise their achievement in reaching the final of this Scottish competition. Well done to all those who were selected and competed. 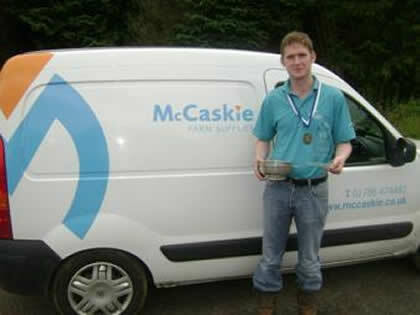 Gold medal winner and recipient of the Quaich – Ryan McShane of Arthur McKay & Company Ltd, Loanhead, who attended Motherwell College. Silver medal winner – Alexander Gardiner of Dalkeith Electrics Ltd, Dalkeith, who attended Edinburgh College, Sighthill Campus. Bronze medal winner – Ryan Gordon of Tulloch of Cummingston Ltd, Moray, who attended Moray College. Ryan Gordon and David Hosey (Deputy Principal, Inverness College UHI). 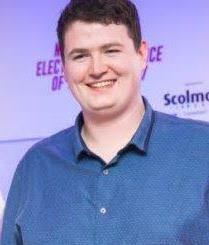 James Donaghy of West Dunbartonshire Council, Dumbarton, who attended Clydebank College. Callum Urquhart of FES Ltd, Stirling, who attended Forth Valley College, Falkirk Campus. Euan Wylie of City Building (Glasgow) LLP, Glasgow, who attended Queenslie Training Centre. Kerr Millar of Gary Bruce Electrical Contractor, Perth, who attended Dundee College. Bryan Edwards of Aberdeen City Council, Aberdeen, who attended Tullos Training. Steven McNee of Stewart McNee (Dunoon) Ltd, Dunoon, who attended Reid Kerr College. Iain Young of Alpha Electrical, Ayr, who attended Ayr College. Stewart Sutherland of Highland Wood Energy Ltd, Fort William, who attended Inverness College. Ryan McShane, Alexander Gardiner and Ryan Gordon have been invited to go forward and compete in the UK skills competition final that is being organised by SummitSkills. The event is taking place on 14 – 16 November 2013 and is being held at the WorldSkills UK Skills Show at the NEC in Birmingham. Good luck to them all! SECTT and South Ayrshire Council are working in partnership to offer additional support, for 10 Electrical Apprenticeship places, to Employers in Ayrshire who are considering recruiting an Electrical Apprentice. This support will take the form of a wage incentive with staged payments totalling £2000, per stage of training, being offered in Stage 1, Stage 2 and Stage 3. The criteria for attracting this support is that the apprentice must live in South Ayrshire and be between 16 and 21 years of age. SECTT currently have a number of applicants who have sat and passed the SECTT test and are ready for interview. Please note that SECTT and Ayr College will be able to offer two classes as long as there are sufficient numbers to support this. The above places are on a first come first served basis. Should you require any further information please contact the SECTT Training Officer, Craig Johnston on 07774712420 or Siobhan Duncan at the SECTT office on 0131 445 5659. 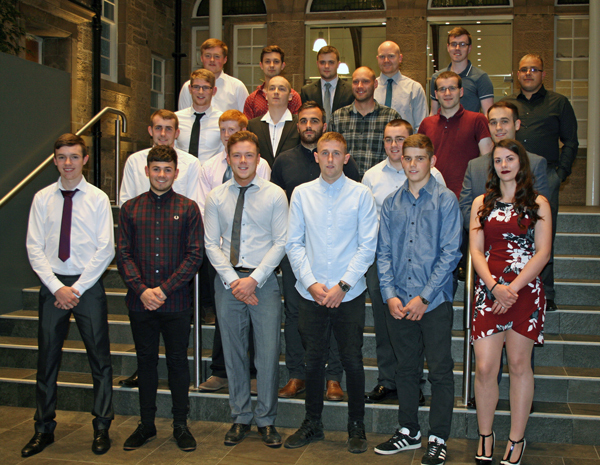 Just weeks after completing a brand new pre-apprenticeship training course a bunch of live wires were back at Dundee College to celebrate their success. This 18 week course at Dundee College included site, general health and safety, electrical theory, electrical practical exercises and 5 weeks work placement with local Dundee employers. The above course was supported by Skills Development Scotland (SDS) and run in conjunction with SECTT. The following companies supported this course and have offered full time employment and the opportunity to move onto the Modern Apprenticeship in Electrical Installation, Pulse Electrical (Dundee) Ltd, McGill Electrical Ltd, R A S Crockett & Partners Ltd, Wardah Electrics Ltd, I S McKenna Electrical Contractors. David Stebbings of SECTT (extreme left) with some of the succesful candidates and their employers (from left) - back row Mark Bannon (Dundee College), Darren Crockett (R A S Crockett & Partners Ltd), Ian McKenna (I S McKenna Electrical Electrical Contractors) and Allan Middleton (McGill Electrical Ltd); front - Liam Holt, Daniel Scott, Robert Spencer and Lewis Rennie. The competition enables 300 pupils and 30 teachers to gain valuable experience and insight to the construction, engineering and building services sectors. Each year since 1999, a team made up of local college and university staff and training providers devise and run a series of construction, engineering and building services challenges for teams of S2 pupils (age 13-14). Our aim is to highlight the varied and exciting careers in the Sector to pupils at this vital stage in their career education. All schools in Edinburgh & the Lothians are invited to put forward a team of 10 S2 pupils to compete in the competition. The following organisations make up the CABEC group: Napier University, Edinburgh College (Telford Campus), SRUC (Oatridge Campus), Capital Skills, West Lothian College, SECTT, with support from SummitSkills and ConstructionSkills. The Grand Final this year was held on the 17th January 2013 at the Edinburgh Corn Exchange. 90 excited S2 finalists and their CDT teachers arrived bright and early to take part in a full day of demanding and fun challenges. Careful scores were kept by the activity providers and at the end of the day the winners were announced by the Minister for Youth Employment, Angela Constance MSP. The winning team was Broxburn Academy and the two runners up were Balerno High School and Merchiston Castle. The feedback we receive from all parties is so positive and shows what a truly valuable event this is. The six apprentices who took part in the final on Tuesday 23rd October 2012 were interviewed by a panel comprising of Fiona Harper, Secretary of the Scottish Joint Industry Board (SJIB), John Noble, Employer Representative and member of the SJIB Board Grading Committee and Scott Foley, Unite the Union representative and SECTT Trustee. 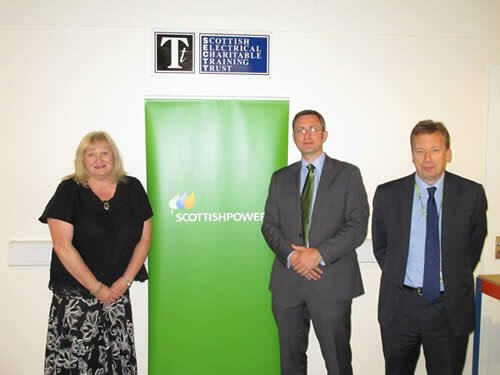 Alexander Gardiner, Jamie Fletcher, Paul Maher & Anne Galbraith (CEO, SECTT). After Amy Garrick finished her literary studies degree she wanted to do something more practical and got a job as an electrical apprentice, which lit the fuse to a new life. She was celebrating after being crowned Scottish Apprentice of the Year. Amy, 28, has spent the last four years training as an electrician with Shetland Islands Council. After receiving the award in Glasgow, the island girl said: "Winning was quite a surprise but I'm overjoyed. I love my job and want to learn more and get better at it. I work with a lovely bunch of people who have been very supportive. How well I've done is a reflection of how well I've been taught along the way." Anne Galbraith Chief Executive of SECTT said "The evening was a great success. The three apprentice finalists would all have been worthy winners. Amy is an exceptional electrician and is an inspiration for other females who are considering entering the Industry." Malcolm came out as the Gold medal winner in this year’s eMAc competition which was held at Perth College in June. He’s a 3rd Stage Modern Electrical Installation Apprentice who attended Loudon Academy in Galston before starting his first job as a trainee dairy engineer. Although this was an interesting job there was no apprenticeship forthcoming and Malcolm then took up the opportunity to start work with McCaskie Farm Supplies as an apprentice electrician. He has made excellent progress and enjoyed the many and varied experiences he’s gained during the last three years. Malcolm recalls his time at Ayr College as very enjoyable, learning a wide variety of skills in well equipped workshops and with great support and tuition from the Lecturing staff. 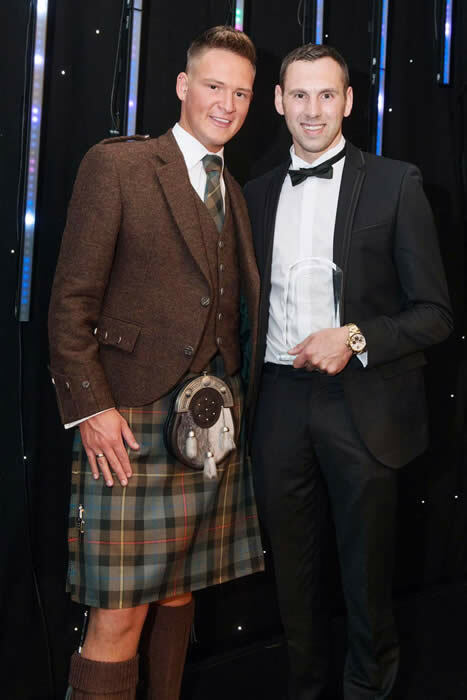 His abilities in all areas were recognised by the staff and SECTT Training Officer and he was selected as the apprentice of the year for Ayr College, he then went on to win the regional heats at Motherwell College and then the Scottish final, all this in his first year! Malcolm continued to excel and again won the regional heat for second stage and came third with a bronze medal in the national finals. His Supervisor at work, Alex Wolschke said that Malcolm has made very steady progress throughout each stage of his apprenticeship; his willingness to listen, learn and ask questions has made him an excellent employee. The quality of work he produces is first class and overall Malcolm has a terrific attitude towards his work. Malcolm commented on the support he has benefitted from, namely his SECTT Training Officer, College Lecturing Staff and his employer have all played an important part of his development and progress. “The help I’ve had during my apprenticeship has been very good; I’ve been visited on site by SECTT, given reports on my progress regularly by college staff and my tradesman, this feedback has been very important to my continued progress”. When asked his thoughts on the SJIB Apprenticeship Scheme, Malcolm stated “I would recommend it to anyone who’s interested in becoming an electrician, it’s a terrific industry to be involved in and an extremely well run apprenticeship”. Malcolm will be representing his employer and Scotland at the UK Skills final at the NEC Birmingham on the 16th, 17th & 18th of November 2012. 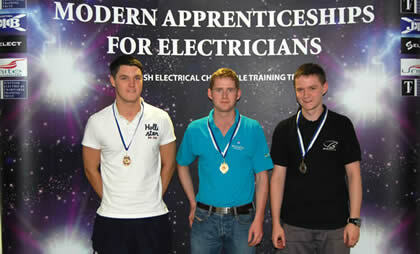 He’ll be competing against 10 other apprentice electricians from all over the UK. This year’s competition was held over 2 days on 27th and 28th June at Perth College. 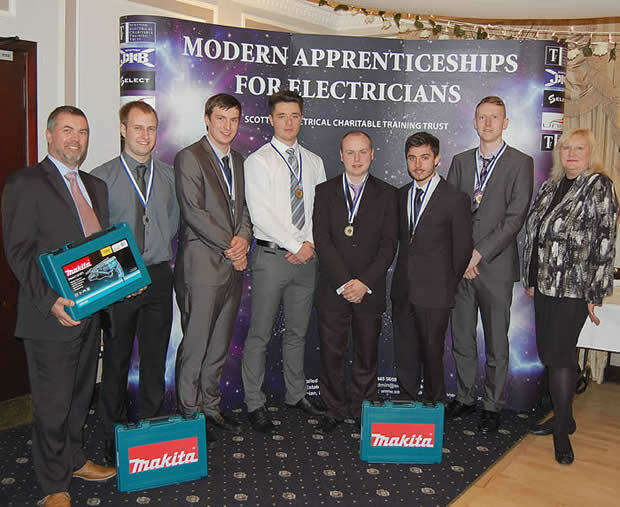 The competitors, 3rd stage 3rd year apprentices from all over Scotland, represented the very best electrical Modern Apprentices in the industry and will, no doubt, become outstanding Electrotechnical operatives. All apprentices and their employers were presented with a framed certificate to recognise their achievement in reaching the final of this Scottish competition. Well done to all those who were selected and competed. Gold medal winner and recipient of the Quaich – Malcolm Brown of McCaskie (Farm Supplies) Ltd, Stirling, who attended Ayr College. Silver medal winner – Thomas Boyle of City Building Glasgow, who attended Queenslie Training Centre. Bronze medal winner – Daniel MacDonald of FES Ltd, Stirling, who attended Forth Valley College, Falkirk. Michael Andison of H F Electrical Ltd, Edinburgh, who attended Stevenson College. Alan Wren of H F Electrical Ltd, Glasgow, who attended Cardonald College. Garry Anderson of Sulzer Dowding & Mills Engineering Services, Aberdeen, who attended Tullos Training. William Ferguson of West Coast Electrical Limited, Acharacle, who attended Reid Kerr College. Craig Stewart of McTear Contracts Limited, Wishaw, who attended Motherwell College. Martyn MacFadyen of G & A Barnie Building Services Ltd, Wick, who attended Inverness College. Malcolm Brown and Thomas Boyle have been invited to go forward and compete in the UK skills competition final that is being organised by SummitSkills. The event is taking place on 14 – 17 November and is being held at the WorldSkills UK Skills Show at the NEC in Birmingham. The winner of the UK final may also have a chance to join the UK Team at the next WorldSkills competition in Leipzig, Germany 2013, where they will compete against other Electrotechnical engineers from all over the world. Good luck to them both! 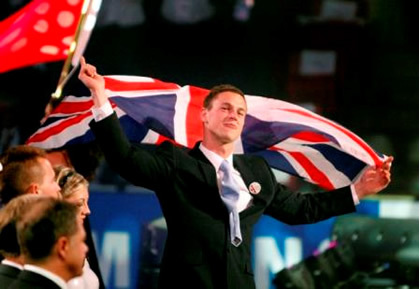 Congratulations to Richard Sagar, winner of SummitSkills’ SkillElectric competition in 2008 and Gold medal winner at WorldSkills in Calgary 2009, who was appointed MBE in the recent Queen’s Birthday Honours. The citation reads ‘WorldSkills Ambassador for Electrical Installation at London 2011, services to Skills’. Richard served his apprenticeship with Eden Electrics Ltd in Langholm, Dumfriesshire and attended Dumfries & Galloway College. Richard completed his apprenticeship in March 2009. Graham Walker, Operations Director from Arthur McKay & Co Ltd commented on the SECTT pre-apprentice course. 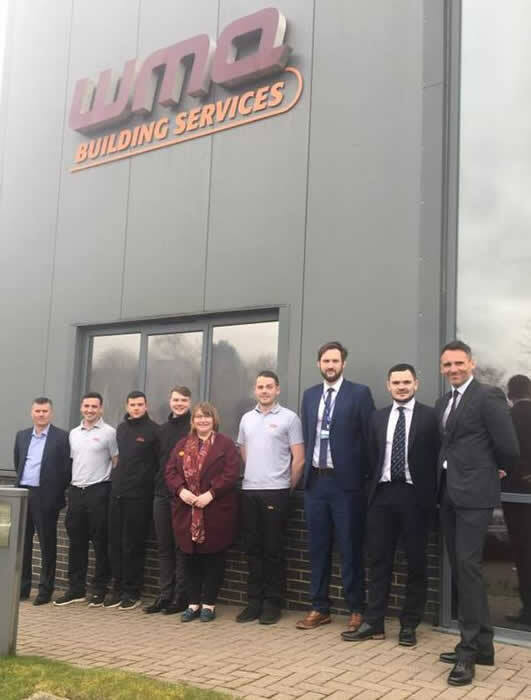 “Over the last few years we have recruited a number of apprentices who came to us via the pre apprenticeship route and this has proven to be a very successful strategy. The main benefits we have found are that the young person has gained a good working knowledge of the Electrical industry thus they know whether or not this is the right career path for them. We as the employer gain a better all round individual who we know wants to pursue their career in this field, they understand what is expected of them from a practical and theoretical perspective. This has led to us recruiting individuals whom we know we can develop and look to as our talent pool for the future. In summary, we believe this is a first class initiative and we have had a very positive experience both on the individuals we have recruited and with the SECTT staff whom we have dealt with. We will continue to utilise this going forward”. Gordon McArthur, Managing Director of Weir & McQuiston (Scotland) Ltd commented “We have found this way of recruiting very useful as, with the college’s feedback and our own interview, it gives us a better idea if the individual is suited to all aspects of an electrical apprenticeship and not just being on a site. We have a fair number of apprentice applications every year and using the college helps with time constraints in going over every single application. We know that from the college the individual is interested in the apprenticeship and ultimately in the electrical industry. Lots of potential apprentices we interview have no real idea of what it would be like on a site and also college. This is eliminated using the college pre-apprentice course”. 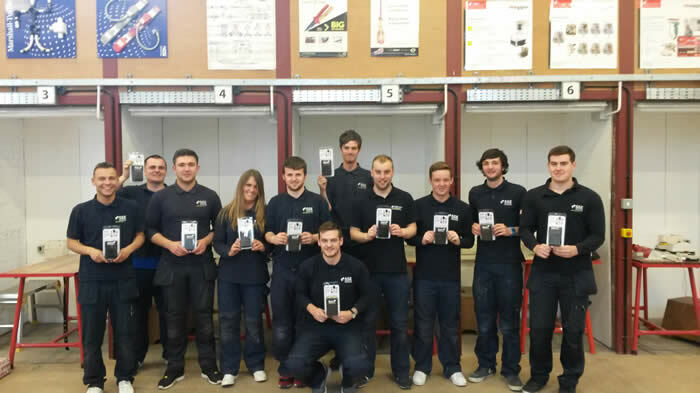 Hundreds of young Scottish electricians will be safely starting their careers - thanks to the Electrical Safety Council (ESC) and the Scottish Electrical Charitable Training Trust (SECTT), who are providing the trainees with free lockout kits worth £25. Four hundred and fifty apprentice electricians will receive the kit, which could potentially save their lives. The contents of the kit helps ensure that electricity in a property is turned off (and stays off) until electrical work is safely completed. This process of safe isolation is crucial in avoiding serious injury - and even death - from electric shock. “It’s vital that everyone in the industry adopts safe working practices and procedures and it’s important that this is established right at the start of an electrician’s career”, explains Phil Buckle, Director General of the ESC. Anne Galbraith, Chief Executive of SECTT adds: “Both SECTT and the ESC are committed to improving safety for our industry and this is a great way to support Scotland’s newest electricians. Our partnership with the Electrical Safety Council means we have been able to share the cost of these vital safety devices and help safeguard the next generation of young Scottish electricians”. The kits will be provided to students studying at 21 Approved Centres across Scotland, - from the Shetland Isles to the Borders- and is just one of the ways the ESC and SECTT support the industry. The ESC offers a range of technical guidance for electricians, including a series of Best Practice Guides, and recently released a safe isolation app for iPhones. More information can be found at www.esc.org.uk. The SECTT website (sectt.org.uk) provides essential information about careers in the electrical industry and useful guidance for employers and young people. The Scottish Apprenticeship Week was organised by Skills Development Scotland, a number of events took place throughout Scotland as well as case studies being put on the website. 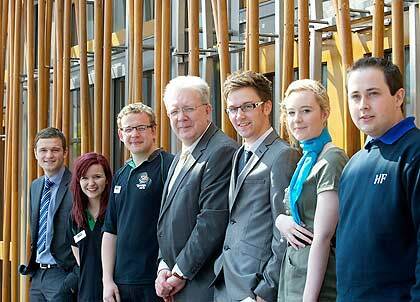 SECTT were invited to put forward two apprentices to be part of a group of six apprentices to meet with Mike Russell MSP the Cabinet Secretary for Education and Lifelong Learning at the Scottish Parliament. They had a half hour round table talk with Mike – who was well briefed on all six apprentices, including our two, and asked some excellent questions. Although Ryan and Paul were very nervous they managed to answer all the questions with ease. They were then asked to take part in a photoshoot. Roy Dow the SECTT Training and Development Manager accompanied the apprentices. Three students from Fife have taken part in a training exchange to Finland which will help shape the future of the region’s renewable energy industry. The trainees, all from Adam Smith College, were selected to work with ground-breaking technology at the Metso Power facilities in Tampere as part of their placement with RWE npower renewables’ £200 million biomass plant at their Markinch site. Michael Wilson (17) and Jamie Forrest (21), who are both from Glenrothes, and Kieran Finnegan (17), from Leven, spent a week with Metso Power experts and were briefed on the boiler’s automation systems, while they were also given the opportunity to get hands-on experience of the technology by assisting with a programme of tests. The trio, were described as a ‘credit to Adam Smith College’.